Towering high above the world’s most iconic cities, these hotels remind you that the world is at your feet. There’s nothing like staying in a skyscraping hotel to get a true sense of a city layout, and Conrad Hotels and Resorts has some of the very best. Located in urban centers with an astonishing array of architecture, these properties were built for those who appreciate a breathtaking cityscape. Dubai is one of the world’s most dynamic cities, anchored by the tallest skyscraper and changing with a fluidity and rapidity unlike anywhere else on the planet. Along Sheikh Zayed Road, the broad avenue that runs parallel to the coast and forms the city’s spine, you’ll find many of the city’s signature buildings, from the distant shores of The World development to the shimmering spike of the Burj Khalifa. 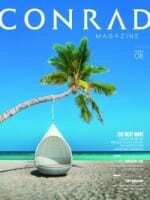 It’s also home to Conrad Dubai, which has hotel rooms starting on the 24th floor, rising up to the 46th. The impressive views show Dubai in its full architectural scope, from the traditional low-rise structures of “old” Dubai and its port through to the city’s glittering new towers. Refresh your senses in the spacious marble bathroom of the Royal Suite, and look out onto an impressive backdrop of towers with the desert beyond. Wherever you are in Hong Kong, you’re never far from the city’s majestic harbour, the feature that has defined, shaped and guided this port city for centuries. Conrad Hong Kong makes the most of its maritime views, serving up vistas from the bedrooms and baths of the rooms and suites located between the 40th and 61st floor. With Hong Kong’s highest point, The Peak, to the south and the Kowloon Peninsula to the north, Conrad Hong Kong offers up a panoramic sweep of Victoria Harbour, with sparkling towers beyond. Ascend to the Executive Lounge on the 59th floor for an elevated breakfast. Chicago is the birthplace of the modern skyscraper. From the iconic “corncob” towers of Marina City to the mighty latticelike façade of the John Hancock Center to Studio Gang’s sinuous Aqua Tower, the city is a living chart of architectural evolution. Conrad Chicago, located close to the city’s cultural heart, puts you up among the city’s spires, old and new, occupying a prime spot in the River North district, where guests can find the USA’s second largest concentration of art galleries after Manhattan. Check-in is on the 20th floor along with its acclaimed restaurant, Baptiste & Bottle. For the best views, look down Michigan Avenue, home to the city’s “Magnificent Mile” of high-end stores and restaurants. Meeting space on the 19th floor impresses with far-reaching views to Lake Michigan. Osaka’s Nakanoshima district is a thin sliver of land that marks the point the Ky -Yodo river splits into the Tosabori and Dojima rivers. A focal point for Japan’s second largest (and perhaps most interesting) city, it’s also home to Conrad Osaka, located in the Nakanoshima Festival West Tower, which provides a perfect vantage point for visitors to take in the city’s rivers, canals and bridges. From the sky lobby, with its unbroken run of vast windows, to the ballrooms and wedding chapels, not to mention the 62-foot pool on the 38th floor, every aspect of the hotel has been designed to capitalize on the view. The first Conrad hotel in Fujian province, Conrad Xiamen occupies a dramatic location on the tip of Xiamen Island, with views across the city’s ancient port and back into the heart of the interior. Formerly the heart of China’s tea trade, Xiamen is considered one of the best places to live in the country. Conrad Xiamen’s floor-to-ceiling windows bring its scenery to life, including the nearby Gulangyu Island, recently recognized by UNESCO on its list of World Cultural Heritage sites. The health club and swimming pool on the 37th floor creates a tempting distraction. Set in the heart of the city’s Yeouido Business District, Conrad Seoul is well placed for spiky skyline views. Nearly all 434 rooms—and every one of the 50 suites—offer panoramas over the Han River and beyond, as well as the other towers of the district dubbed “Seoul’s Wall Street.” In the main lobby is the country’s tallest staircase, a winding spiral that rises up 120 feet, while the hotel’s 37 Grill & Bar is a high-rise dining delight (situated, naturally, on the 37th floor). Lovers of architectural drama should choose the Grand King Corner Suite for its wraparound views of nearby Yeouido Park with the Bamseom islets in the distance. Hilton Honors members can pick their room with the perfect view of these cities ahead of their stay.